There are 3 new stamp kits in the Paper Garden Projects Store. 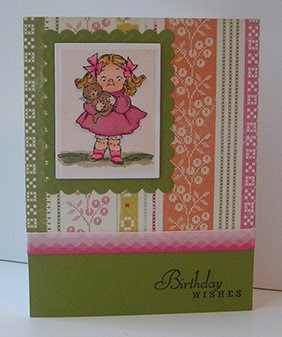 The kits include stamps, patterned paper, cardstock, ribbon and embellishments - all coordinating. These new kits contain adorable vintage images of children. Sugar and Spice is a collection of little girls. These are samples from the Sugar and Spice kit. Little Boy Blue is a collection of boys (of course). Kids At Play has images of boys and girls playing together. For this card, I cut out one of the images with my Spellbinders oval Nestable Die, and also cut and embossed the scalloped oval matte. The image is colored with Copics. The strip is cut from pattern paper included in the kit. 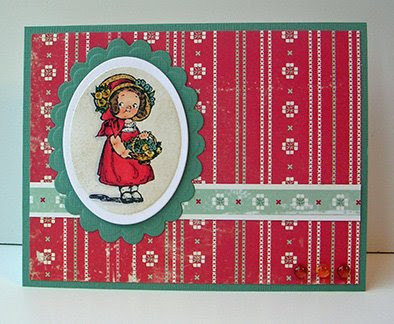 I really like the way the homespun, vintage-y papers coordinate with the stamps. I kept my cutting die in place after I cut and embossed, then dusted the image lightly with a duster brush and distress ink. When you remove the die, you get the white border. (just remember to clean the die so you don't get ink on your next project - I just use a baby wipe). This image is colored with Copic's as well. 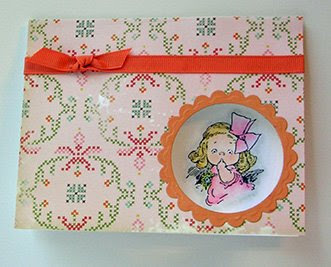 For this last one, I used the Spellbinder circle dies to cut a window for my image. The image here is colored with Prismacolor pencils and odorless mineral spirits. Copic markers always bleed through paper - so if you use them inside the card, you'll have color blobs on the back side. So I switched to my pencils. I had so much fun coloring these images! So cute! Those little girls remind me of the little girls from the Campbell's soup commercials. These are so cute! I do not usually purchase kits but these may have pushed me over the edge- teeheehee! I have been wanting to purchase a airbrush system to go with my Copics to get the stenciled effect like you have here! Definitely going to give the duster brush a try as soon as I can! Love your blog! Oh these are so cute! Adorable images.